Spend the night in a work of art at the Beaumont Hotel in London. 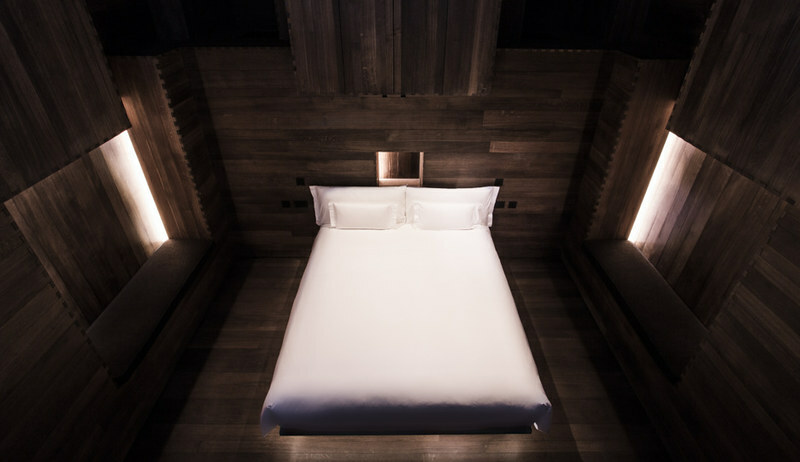 ROOM, the first-ever hospitality project by award-winning sculptor Antony Gormley, is a modern suite featuring a double bed floating within a dark, wood-panelled, cave-like space, which is the artist's rendition of darkness. Designed to create a cocoon-like environment for guests to enter a different state of consciousness and withdraw from daily stresses, the unique suite offers a meditative environment. There's also a sleek bathroom white bathroom hidden behind black curtains, sitting area, and large hallway in a soft Art Deco-inspired style in-line with the rest of the hotel. Situated in London's upscale Mayfair neighborhood, the Beaumont Hotel is luxury boutique hotel located in a historic 1926 building overlooking the Brown Hart gardens. Offering 50 guest rooms, 13 studios, and 10 suites, the upscale hotel feature an eclectic mix of art, and Art Deco styling. Nestled along a quiet, landscaped square, the property is within walking distance of boutiques and restaurants along Mount, South Audley, and Bond Streets. Five Star Alliance Perk: Reservations booked under the "5 Star Signature Package" rate or the "Best Available Rate" include a full breakfast for two daily in The Colony Grill Room or through room service, one way transfer in Mercedes E Class from or to a nearby London airport or train station, cocktails for two once during the stay in The CUB Room a Private Residents' Bar & Lounge, complimentary WiFi, and an in-room welcome amenity. Originally the home of Lords and Ladies of the Royal Court, Taj 51 Buckingham Gate occupies three palatial townhouses that overlook a private courtyard. Within the regal retreat there are a variety of 1, 2, or 3 bedroom suites, as well as larger residences and four signature suites, including the Jaguar Suite. The only one of it's kind in the world, the Jaguar Suite has specially-commissioned furniture, artwork, and displays. Overseen by Ian Callum, Jaguar's Design Director, the two-bedroom suite features a sleek design inspired by classic and contemporary Jaguar models. From polished wood paneling in the entry to a clean-fuel fireplace that references the iconic brand's rear window, custom-made Jaguar wallpaper, and a wall covered in Italian leather, the suite provides an ideal place for motor enthusiasts. Within the living room, there is a 42-inch TV with Denon and Creston superior sound systems, Sonance ceiling speakers, a balcony overlooking the hotel's courtyard. Plus, guests of the suite have exclusive access to a chauffer driven Jaguar XJ, full butler service, and a fully-stocked bar. Continue reading below the photo of the Jaguar Suite. Providing guests with signature bespoke services, the five star Taj 51 Buckingham Gate offers a location close to Buckingham Palace and Mayfair. Just a short walk from some of the city's top landmarks and attractions, the property has Taj's Golden Keys Concierge Service, two bars, spa, and fitness center. For dining, there are three restaurants on-site including the Michelin-starred Quilon, and Bistro serving classic European cuisine. In addition, the property offers themed tea parties like Alice in Wonderland Afternoon Tea, as well as an opulent 24 Karat Gold Afternoon Tea. Continue reading below the Afternoon Tea photo for a special perk offer for Five Star Alliance guests. Five Star Alliance Perk: All guests making reservations with Five Star Alliance receive complimentary full English breakfast daily in the Kona Restaurant, a $100 USD equivalent food and beverage credit, 20% off treatments at the Wellness Center, and complimentary WiFi. Also, subject to availability at the time of check-in/departure: a room upgrade, early check-in, and late check-out. Guests staying a minimum of 4 nights (or in the Cinema, Jaguar or Presidential Suites) also receive a one way airport transfer. Happy 2018! The start of the new year is the perfect time to start planning adventures near and far. 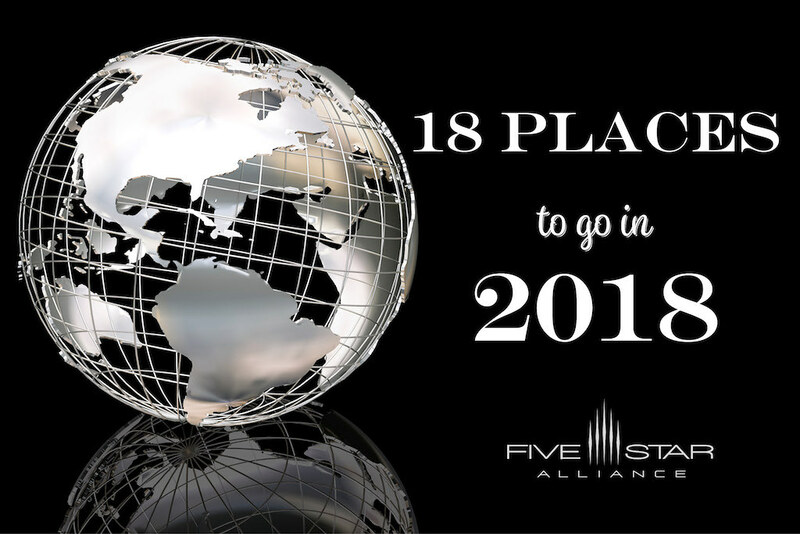 From bucket list destinations to weekend getaways, we've put together a list of our top 18 picks for places to go in 2018. Following a two-year renovation, the half-mile-long Vasari Corridor will reopen this year. The 16th century passageway was built by the Medicis to move unseen across the Arno River between the Pitti Palace and the Uffizi Gallery offices. The Renaissance city also recently celebrated the opening of the Franco Zeffirelli Center for the Performing Arts in Plaza San Firenze with a lineup of classical music and Italian film events. In October, the Uffizi will unveil Codex Leicester, featuring a special collection of scientific drawings and writings by Leonardo da Vinci (on loan from Bill Gates). For views of Il Duomo (and special perks for Five Star Alliance guests) Brunelleschi Hotel Florence is located in the city's pedestrian-only historic center with an upscale Italian restaurant and traditional trattoria. Hotel Il Salviatino is set within a 15th century villa that features views of Florence and the rolling Tuscan hills, while Belmond Villa San Michelle is located on a hillside overlooking the city in a former monastery with suites, Tuscan dining, pool, and special perks for Five Star Alliance guests. Celebrating its 300th birthday in 2018, the city of New Orleans will be hosting more than 160 events throughout the year to commemorate the tricentennial year. Always a haven for jazz lovers, history buffs, and foodies, there's a variety of events taking place annually including Mardi Gras in February, April welcomes Jazz Fest, and July is the time for Tales of the Cocktail where bartenders from around the world show off their skills in the city where cocktails were invented. The W New Orleans French Quarter is steps from Jackson Square, as well as live Jazz venues and popular restaurants. For historic charm along with an Oyster Butler, Crawfish Concierge, and Snowball Sommelier, The Ritz-Carlton, New Orleans offers a classic setting in two historic buildings on Canal Street. The NOPSI Hotel provides a boutique setting in the heart of the business district with Spa Suites, local cuisine, and a rooftop pool and lounge. While Le Meridien New Orleans features contemporary design with French-inspired amenities and a rooftop pool in downtown. Known for classical music and the festive ball season, in 2018 Vienna is celebrating Modernism, as four of the art movement's most important artists--Gustav Klimt, Egon Schiele, Otto Wagner, and Koloman Moser passed away 100 years ago. The Beauty and the Abyss celebration of Modernism will celebrated with with special exhibitions at a variety of venues including the Leopold Museum, Lower Belvedere, MAK--Austrian Museum of Applied Arts/Contemporary Art, Wien Museum, Kunsthistorisches Museum Vienna, and the Jewish Museum Vienna. The historic Hotel Sacher Wien provides a central location in the heart of the city, opposite the Vienna State Opera House and next to the Albertina Gallery with a traditional Austrian coffeehouse and fine dining. Nearby, The Hotel Bristol Vienna, a Luxury Collection Hotel offers a historic setting with fine dining at the Art Deco Bristol Lounge, fitness center, and meeting venues. 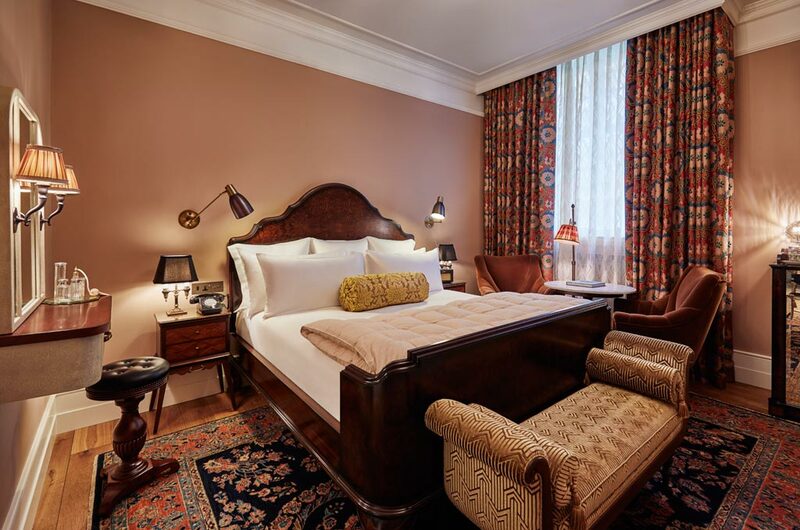 Built in 1863 for the prince of Württemberg, Hotel Imperial provides world class service and a unique location on the famous Ringstrasse next to the Musikverein Vienna. Home to an array of art galleries, Buenos Aires is partaking in the inaugural, yearlong Art Basel initiative, which will include art lectures, workshops, as well as showcase local and international artists. In October, the city is hosting the Youth Olympic Games. The trendy Tegui restaurant in the Palermo neighborhood made the list of the World's 50 Best Restaurants. Situated in El Porteno Building, Faena Hotel Buenos Aires allows guests to experience the city like a Porteno in an atmosphere dedicated to art and fine living. Decorated in Empire and Louis XV style, the Alvear Palace Hotel serves classic Afternoon Tea at L'Orangerie and the Cigar Bar with an exclusive selection. While the Park Hyatt Buenos Aires is located along the Avenida Alvear with fashionable shopping and a luxury spa. Offering four distinctive seasons of outdoor activities, Minneapolis will be hosting the Super Bowl on February 4. Surrounding the Big Game festivities, there will be concerts, ice sculptures, and an Ice Palace in nearby St. Paul. While the city is known for cold winters, spring, summer, and fall provide idyllic weather for exploring the state's multitude of lakes, biking trails, and parks. Plus, Prince's Paisley Park recently opened for tours, the Walker Art Center recently remodeled their outdoor sculpture garden, the Uptown Art Festival the first weekend in August showcases local and international artists, and the annual Minnesota State Fair (August 23 to September 3, 2018) attracts visitors from all over the world. The W Minneapolis - The Foshay is an art deco landmark transformed into a chic boutique hotel, Loews Minneapolis is connected to the downtown area's skyway system and steps from Target Center and Target Field, and the Marquette Hotel is located in the inconic IDS Center. Not far from the Great Pyramids, The Grand Egyptian Museum is set to open in 2018. Designed by Heneghan Peng Architects, the new museum will showcase more than 100,000 artifacts, as well as an atrium with a floor-to-ceiling glass wall with panoramic views of the Pyramid of Menkaure and the Great Pyramid of Khufu. The Nile Ritz-Carlton features exclusive Nile views with a rooftop bar, Afternoon Tea, and Egyptian-infused spa. Situated thirty minutes from the Sphinx and Great Pyramids of Giza, The Fairmont Cairo, Nile City is located within the Nile City Corporate Complex and offers a full-service Willow Stream Spa and a rooftop poolside sky bar with panoramic views of the city and pyramids. For a boutique setting, Kempinski Nile Hotel Garden City Cairo blends European luxury mixed with regional influences on the eastern bank of The Nile River. There's another royal baby due in the spring, and it's time for another Royal Wedding! Making London one of the places to be this year. Plus, there's a new movie about Winston Churchill, giving visitors the perfect reason to check out Churchill's War Rooms, and other historic sites throughout the British capital. Overlooking Hyde Park, The Wellesley is a boutique hotel close to Buckingham Palace with the Crystal Bar, Oval Restaurant, and one of Europe's largest Cigar Humidors. Combining English heritage with contemporary styling, Rosewood London offers fine dining, spa, and sophistication where the city meets Covent Garden and the West End on High Holborn. 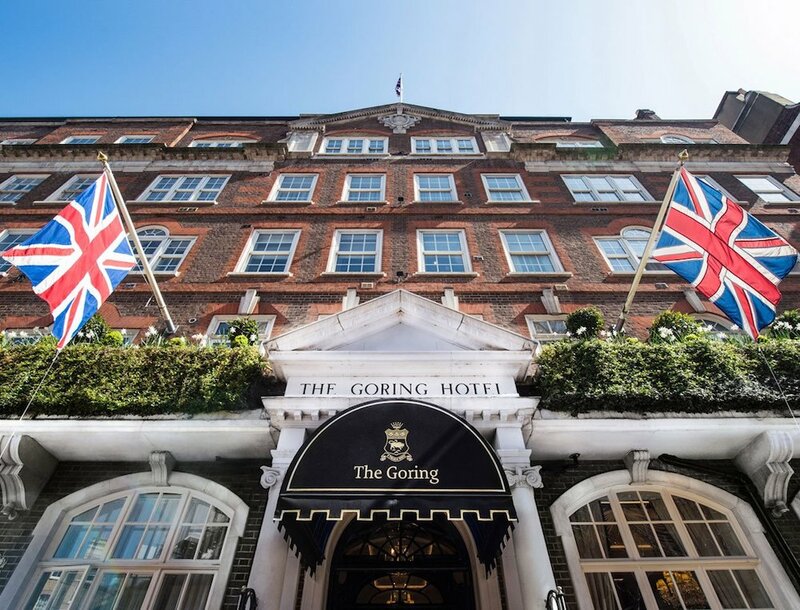 Situated in Belgravia, The Goring Hotel offers an unbeatable location close to Buckingham Palace with a Michelin-starred restaurant and classic English style. Booming with hip restaurant openings, new luxury resorts, and major renovations, the Baja Peninsula's San Jose del Cabo and Cabo San Lucas offer beachfront retreats. In addition to new resorts and dining options, the farm-to-table food scene is hot, as are the region's beaches and chic nightclubs. The recently opened Chileno Bay Resort & Residences provides a bayfront setting within a resort community with a swimmable beach, open-air dining, multi-level infinity pool, and championship golf. The Cape - A Thompson Hotel provides beachfront luxury with bi-level suites with private rooftops, private stairway to the surfing-friendly Monuments Beach, and regionally-inspired cuisine. While The Resort at Pedregal is reachable only via a private tunnel with 24 acres of mountainside property, featuring newly opened villas and revitalized culinary offerings. This year, the island nation of Mauritius is celebrating 50 years of independence after years of colonization by the United Kingdom, France, and the Netherlands. The airport is expanding and transforming into a hub for traveling to Asia, English is the dominant language, and the architecture and culture mix African, French, Chinese, and Indian traditions. Known for relaxed resorts and tropical mountain peaks, the country offers a retreat surrounded by the Indian Ocean. For privacy and luxury, Constance Le Prince Maurice has 64 Junior Suites, plus Family Suites, villas, and a Princely Suite, as well as the U Spa, Kids' Club, shopping, and two 18-hole golf courses. The Residence Mauritius provides a beachfront setting with accommodations in turn-of-the-century-inspired plantation houses, with family-friendly and adults-only pools and special perks for Five Star Alliance guests. While the oceanfront Constance Belle Mare Plage has a variety of water-focused recreation, four swimming pools, seven restaurants, and five bars within a tropical setting. This island country is the designated European Capital of Culture in 2018, where the arts will be celebrated in a country that mixes Sicilian, North African, and Colonial England cultures. There's ornate architecture throughout the island, including the baroque St. John's Co-Cathedral, pre-historic ruins, and the must-try Stuffat tal-fenek--the national dish of rabbit stew. In January, Valetta's National Baroque Festival is held, and the Grand Excelsior Hotel makes an ideal base for exploring the capital city with indoor and outdoor swimming pools, Le Grand Spa, and a marina. The InterContinental Malta provides a modern island retreat with a casino, six restaurants and bars, spa, conference center, and spa close to Valetta, while The Xara Palace features a boutique setting in the medieval city of Medina. This Nordic capital city is marking two important events in 2018. Norway's King and Queen are celebrating their 50th wedding anniversary, and the modern Oslo Opera House is marking it's 10th year with a season of celebratory performances. The Hotel Continental Oslo offers a historic setting next to the National Theater, and close to the city's revitalized harbor with special perks for Five Star Alliance guests. While the Grand Hotel Oslo offers a grand setting along Karl Johan's Gate close to shops and sidewalk cafes. For a contemporary setting, the Radisson Blu Plaza Hotel Oslo soars 37 stories above the Oslo Fjord. Marking its 300th anniversary this year, San Antonio has recently unveiled a variety of new developments, including the Bottling Department (the city's first food hall), the iconic barges along the River Walk were upgraded with electric models, and San Pedro Creek Culture Park transformed an old drainage ditch into a waterfront promenade with performance and art spaces. Special Tricentennial commemorative events will take place May 1-6, including events at each of San Antonio's five missions. On the historic River Walk, the Omni La Mansion del Rio is celebrating it's 50th anniversary of being transformed from a Catholic School into a luxury hotel for the 1968 World's Fair. The Grand Hyatt San Antonio overlooks the River Walk with an outdoor pool, sundeck, and special perks for Five Star Alliance guests. For those seeking a resort setting overlooking Texas Hill Country, La Cantera Resort and Spa recently underwent a complete renovation, and offers furnishings inspired by the area's ranch heritage, two championship golf courses, and five pools about 30 minutes from downtown. In the midst of reinvigorating its artistic past, Sevilla is currently celebrating the 400th anniversary of Bartolomé Esteban Murillo, a homegrown Baroque painter with special one-of-a-kind exhibitions. The city is also hosting the 31st European Film Awards, and the historic center provides an enchanting blend of architectural styles including a Gothic cathedral, medieval lanes, Flamenco clubs, baroque churches, and Mudéjar palaces. Once the Moorish capital, today Sevilla is the capital of Andalucia, offering luxury hotels such as the historic Hotel Alfonso XIII in the historic center with traditional architecture, courtyard, and regional cuisine. Nearby, Gran Melia Colon is furnished with reproductions of artwork by Spanish masters, a boutique hotel with RedLevel service within the hotel, and dining venues serving modern Andalusian cusine. For a well-preserved example of Spanish Renaissance architecture, Casa de Carmona is located about 20 minutes north of Sevilla and offers accommodations within a palace built in 1561, and fine dining in the former stables. Millions of visitors go to this famous UNESCO World Heritage Site with 275 roaring waterfalls straddling the border of Argentina and Brazil. To accommodate the influx of visitors, Cataratas del Iguazú Airport is expanding and modernizing. Within the national park, the Ecological Jungle Train that takes visitors on a 25-minute journey to the Devil's Throat Cascade is being converted from gas to electric, and multiple luxury resorts are set to open later this year. On the Brazil side of the falls, Belmond Hotel das Cataras offers guests exclusive access to the falls as well as a pastel-pink hideaway with gardens, fine dining, and a luxe outdoor pool. While The Iguazu Grand Resort Spa and Casino is located on the Argentina side of the falls with a full-service resort setting including authentic Argentine dining at La Terraza and the Spa del Parasiso providing treatments infused with natural ingredients like yerba mate and chocolate from nearby sources. Last year Canada celebrated 150 years, and Toronto continues to add to the city's cosmopolitan "it" factor with new luxury hotels like the Bisha Hotel Toronto, along with hip restaurants with an understated Canadian vibe are taking the city to a new level. In 2018, the Museum of Contemporary Art is relocating to a former factory in the Junction Triangle, and VIKINGS: The Exhibition at the Royal Ontario Museum runs through April 2, 2018. The Thompson Toronto offers a modern residential style with floor-to-ceiling windows and a rooftop pool with skyline views. While The Ritz-Carlton, Toronto provides a classic downtown retreat along Wellington Street. In 2016, Bangkok was the most visited city in the world, with more than 21 million guests. Its popularity is sparking a rise in new luxury hotels and restaurants. In 2018, The Michelin Guide will debut, giving even more attention to the city's creative culinary atmosphere. For art enthusiasts, Warehouse 30 is opening in transformed World War II warehouses, ChangChui is a new entertainment complex constructed from upcycled materials, and the Thailand Creative & Design Center is moving to the iconic Charoen Krung Road in a space that was once a post office. To stay in the heart of Bangkok's historical palaces and temples, The Siam Hotel is set along the River of Kings with bespoke cultural amusements and an urban resort design with spacious suites, pool villas, and open-air roof terraces. Soaring 39 stories, The Peninsula Bangkok features panoramic city views on the banks of the Chao Phraya River and a three-tiered swimming pool. For contemporary style, Anantara Bangkok Sathorn is located within a 37-floor twin tower with an infinity pool and holistic spa treatments. Referred to as the "City of Mozart" and the "Rome of the North" , Salzburg was a church state for more than 1,100 years. Symbols of the Catholic Church can be discovered throughout the historic Old Town of Salzburg, which is a UNESCO World Heritage Site. In 2018, the City of Salzburg will celebrate the 200th anniversary of "Silent Night", which was written and first performed in the village of Oberndorf near Salzburg on December 24, 1818. The special exhibition "Silent Night 200 - History. Message. Present." will be open September 28, 2018 to February 3, 2019, and the musical "My Silent Night" will be performed at the iconic Felsenreitschule on November 24, 2018. Hotel Sacher Salzburg provides idyllic views of the Hohensalzburg Fortress, as well as fine dining at the Zirbelzimmer, and the Original Sacher-Torte cake in the Sacher Cafe. In the baroque city center, Hotel Goldener Hirsch combines a historic setting with Austrian style and state-of-the-art amenities, while Schloss Fuschl Resort and Spa features a lakeside setting in the Archbishop of Salzburg's former hunting lodge. As the events capital of Australia, Melbourne is a growing city offering a cosmopolitan core that serves as an ideal gateway to exploring a variety of Australia's attractions, including the Phillip Island penguin walk which is 90 minutes from the city, and an hour and a half north of the city is the Nagambie Lakes, one of the country's oldest viticulture areas with renowned wineries and outdoor activities. For a grand setting opposite Parliament, The Hotel Windsor was built at the top of Collins Street in 1883. For panoramic views of the skyline and Yarra River from the hotel pool, Langham Hotel Melbourne provides an elegant setting on the Southbank Promenade, and the Art Series The Olsen is a luxury boutique hotel on Chapel Street. Set along the River Thames, London is full of historic sites, royal parks, world-class museums, sophisticated shopping, and endless neighborhoods to discover. From the iconic Big Ben and Parliament to Buckingham Palace, there's iconic vistas around every bend. Founded in 50 AD by the Romans, the original City of London still has original Medieval walls. Today, Great Britain's capital city provides visitors with a mix of contemporary and classic. The Royal Parks are ideal for strolling, and Afternoon Tea makes for an ideal time to relax and partake in a quintessential British tradition. The London Eye provides a bird's eye observation of the city, and the Tate Modern on the South Bank has an extensive collection of modern art. Westminster Abbey and St. Paul's Cathedral offer centuries of history and breathtaking architecture, while Knightsbridge has upscale shopping such as Harrod's and Harvey Nichols. For dining, London offers an array of Michelin-starred restaurants, chic cafes, gastropubs, and classic British Pubs. The West End has a collection of theaters with major musicals and touring productions. While Soho, Shoreditch, Hoxton, and Dalston offer a variety of nightlife options including cabaret and Charleston revival parties, burlesque, and undergound bingo. As one of the world's top cities, London hosts a variety of events throughout the year including Wimbledon (July 3 to July 16, 2017), RideLondon festival of cycling (July 28 to July 30, 2017), Londinium festival where participants travel back in time to Roman London (July 28 to October 29, 2017), BBC Proms 2017 classical music festival (July 14 to September 9, 2017), IAAF Marathon (August 6, 2017), Gladiator Games (August 25 to August 28, 2017), Fashion Week (September 21 to September 24, 2017), and the NFL Ravens v. Jaguar game at Wembley Stadium September 24, 2017. There's also Halloween events in late October, Hogwarts in the Snow (November 18, 2017 to February 3, 2018), as well as Holiday Markets in November and December, and New Year's Eve Fireworks. To compliment London's activities and cultural options, Five Star Alliance offers a selection of luxury hotels that will appeal to a range of travelers including Regal Properties, Designer Boutiques, and Creative Retreats. 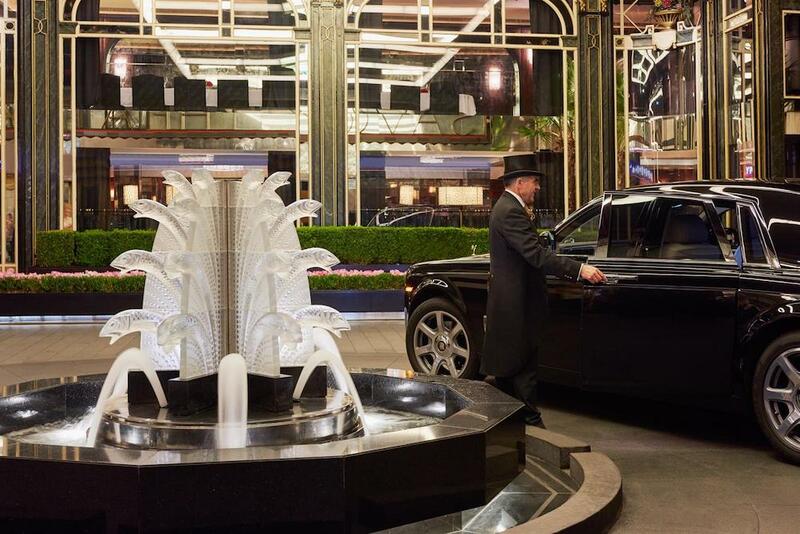 Welcoming royals, dignitaries, and celebrities for more than 150 years, The Langham London is located in the heart of the West End. Since 1865, the hotel's Palm Court has been a reknowned destination for its bespoke version of Afternoon Tea, and the recently unveiled Langham Club Lounge provides guests with an ultra-exclusive setting with complimentary breakfast, chef-created menus, modern conveniences, and attentive service. Plus, the Artesian was awarded "World's Best Bar" and Roux at the Landau provides an elegant atmosphere for classic cuisine with a modern touch. Adjacent to Buckingham Palace, The Goring Hotel is a family-owned luxury hotel known for service and hospitality. Favored by the Queen for Afternoon Tea, this hotel offers sophisticated decor and The Dining Room received a Michelin Star in 2015. Located in the opulent Belgravia neighborhood, the family-friendly hotel is close to major attractions, and provides a number of family guest rooms as well as amenities for young travelers. 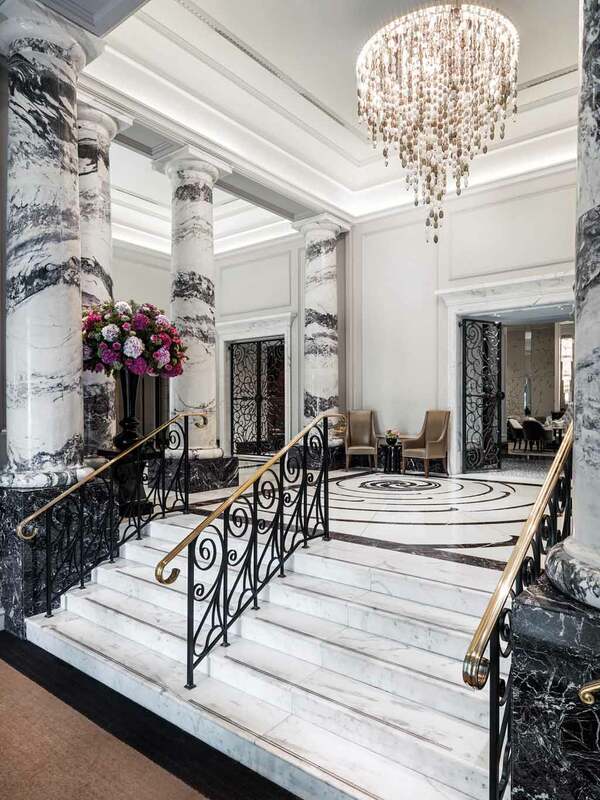 A British icon since opening in 1889, The Savoy London underwent a £100 million restoration, restoring its English Edwardian and Art Deco interiors while seamlessly blending modern amenities and discreet technology with timeless elegance. 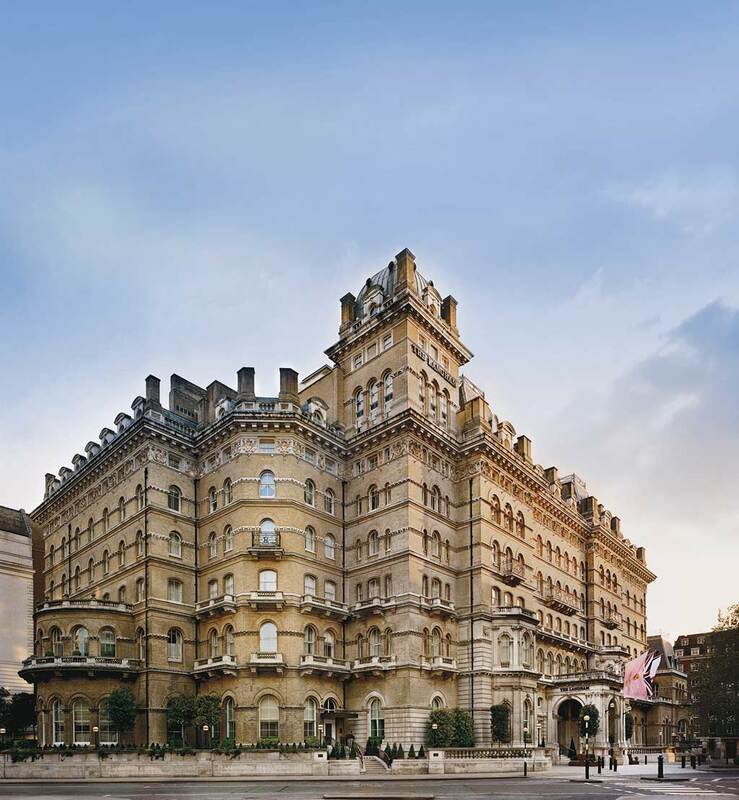 Set along the River Thames, the Fairmont managed hotel is offering a variety of culinary events and master classes throughout 2017, including Historical Tours with The Savoy's Archivist that concludes with a glass of Champagne, a Dinner Dance, and a Chocolate Master Class. 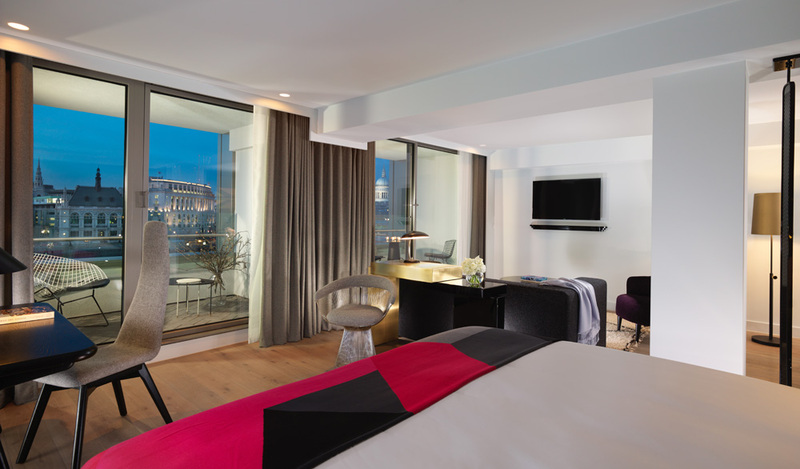 Set within the former Midland Bank Building, The Ned is a recently opened boutique hotel close to the Tower of London and St. Paul's Cathedral. The private Ned's Club offers an exclusive rooftop pool, Canopy Bar & Restaurant, Princes Street and Poultry Domes lounges, along with panoramic London views. Within the lower levels of the building is the original vault, which is home to Vault Room lounge bar, plus the Ned's Club Active with cardio and strength training equipment, as well as the spa. 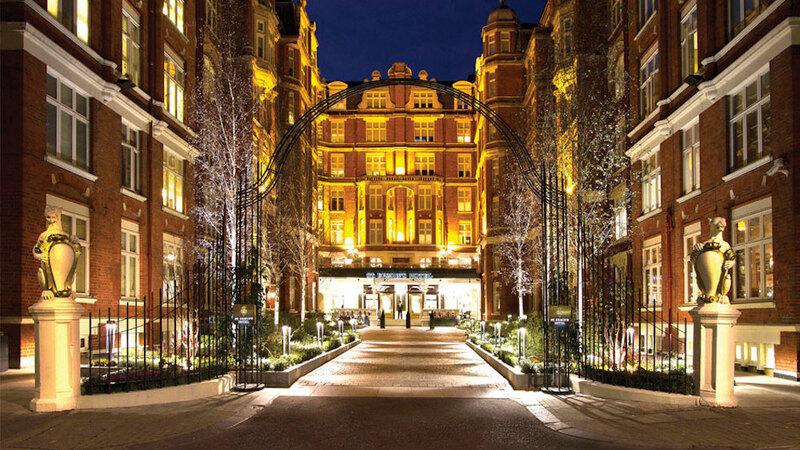 Nestled along a tree-lined courtyard, St. Ermin's Hotel London is located in the heart of Westminster on the site of a 15th century chapel dedicated to St. Ermin. In 1889, the property was expanded into townhomes, and transformed into a hotel in 1899. Winston Churchill held a historic meeting at the property in 1940, and today the boutique hotel offers guests the opportunity to step into history, while experiencing luxury amenities such as marble bathrooms, state-of-the-art entertainment systems, and White Company products. The St. Ermin's Tea Lounge offers a stylish Afternoon Tea with honey and produce sourced from the hotel's rooftop garden and bee hives, Caxton Grill serves Modern European cuisine, while the Caxton Bar has signature flights and a warm, historic atmosphere. Overlooking Hyde Park, The Wellesley, a Luxury Collection Hotel is set within a historic townhouse. 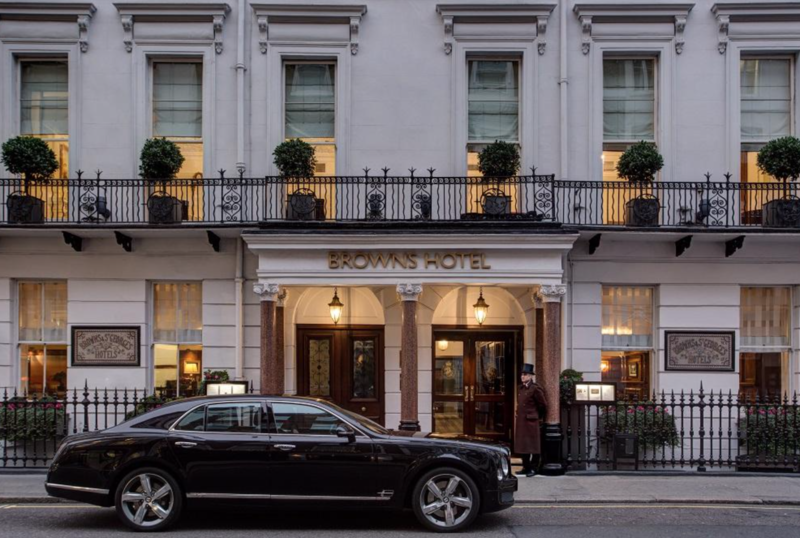 Offering discreet elegance steps from Buckingham Palace, guest rooms and suite provide a modern take on Art Deco styling with tufted headboards, original artwork, sleek wood furniture, and Hermes bathroom amenities. 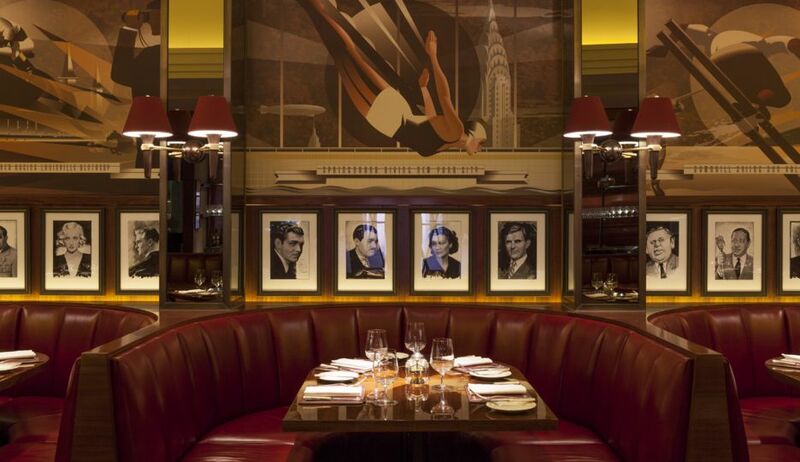 The Crystal Bar has a chic and stylish setting with live music and crafted cocktails, the Oval Restaurant serves elegant Italian cuisine, and the hotel is home to one of the largest cigar humidors in Europe. Featuring views of Brown Hart Gardens, The Beaumont is a luxury boutique property in the city's Mayfair district. 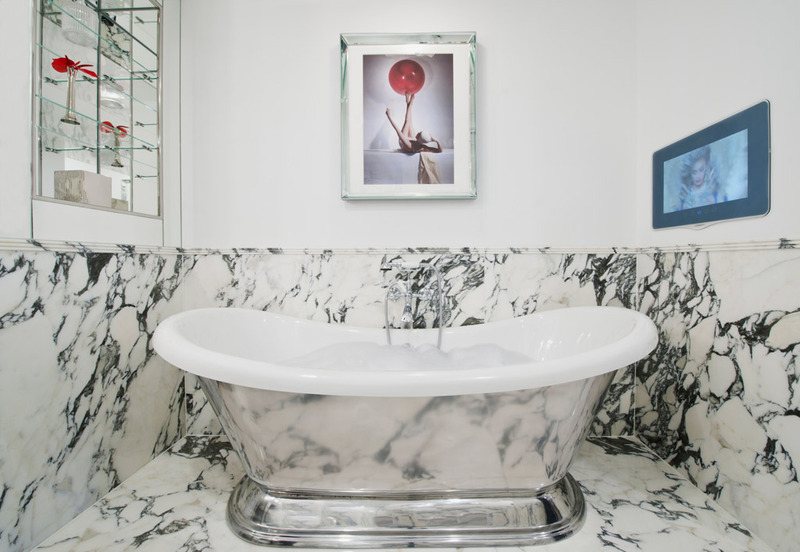 Situated within a historic 1926 building, the property features classic styling infused with Art Deco touches. One of the hotel's highlights is ROOM, an experiential work of art commissioned from Turner Prize-winning British sculptor, Antony Gormeley. The massive, modular piece forms part of a suite with stainless steel and fumed oak. The Colony Grill Room (shown in the image above) offers upscale dining seven days a week, and the American Bar serves casual snacks and classic cocktails. Providing the privacy of a private home with the expertise and service of a luxury hotel, Taj 51 Buckingham Gate offers a discreet setting with butler service, contemporary bathrooms, and suites with modern kitchens. Housed in a Victorian building, there is 24-hour in-room dining, and award-winning southwest coastal Indian cuisine at the Michelin-starred Quilon restaurant. There's an outdoor courtyard with Afternoon Tea in the summer, and Bank Westminster serves classic British fare with a modern twist. Five Star Alliance Perk: Guests making reservations through Five Star Alliance receive full English breakfast at the Kona Restaurant, 50 GBP food and beverage credit, and complimentary wifi, plus subject to availability, a room upgrade, early check-in, or late check-out. Guestst staying four or more nights receive a one way airport transfer. Perched along the River Thames in the Sea Containers building, Mondrian London has river view balcony suites directly along the river. Under the direction of renowned British designer Tom Dixon, the property mingles 1920s cruise ship glamour with the building's original style and infused with modern twists. For dining and socializing, the Rumpus Room has a rooftop bar with an outdoor terrace and glass box structure, Dandelyan offers an iconic green marble bar with innovative cocktails, and the Sea Containers Restaurant serves locally-sourced cuisine with indoor and outdoor river walk seating. The properties mentioned in this post are just a few of the Five Star luxury hotels in London. 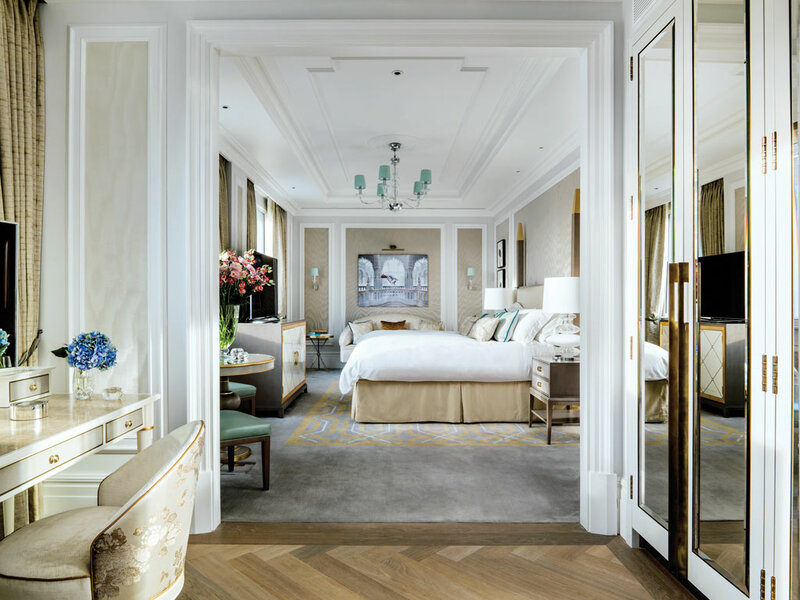 Offering up to six bedrooms along with a private entry protected with CCTV cameras, the Sterling Suite at The Langham London is one of the city's most spacious and sought-after suites. Providing an elegant residential penthouse setting, the 450-square-meter space offers bespoke furnishings from the top British craftsmen. Within the suite there's an opulent dining room, expansive Drawing Room with a piano, full size work desk, Langham Blissful Bed, and an innovative private media lounge. The suite includes 24-hour personal butler service, and there's a butler's pantry for hosting guests, as well as a VIP private bar customized to accommodate personal preferences. While the large marble bathroom has a separate shower and bath tub, plus bathrobes, slippers, and signature toiletries. Continue reading below the photo of the Sterling Suite. 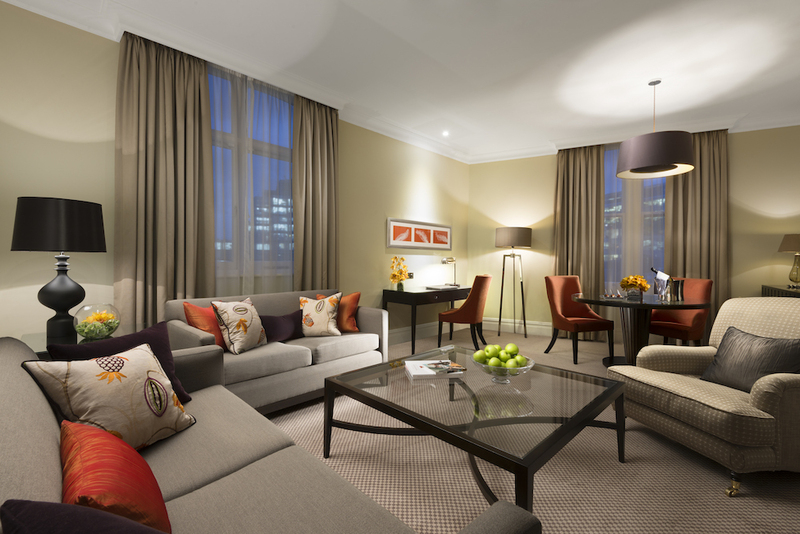 The Langham London is located in the heart of the West End. The property has welcomed celebrities, royalty, and dignitaries for more than 150 years, and the hotel's Palm Court is known as the birthplace of the Afternoon Tea tradition. Read more below the photo. The Roux offers classic chef-prepared dishes prepared with locally-sourced ingredients, and The Wigmore offers a luxurious British Pub setting. There's also the Chuan Body + Soul offering a full range of spa and wellness treatments, fitness center, and indoor swimming pool. Dogs are part of the family too, so why not include them on your next vacation? 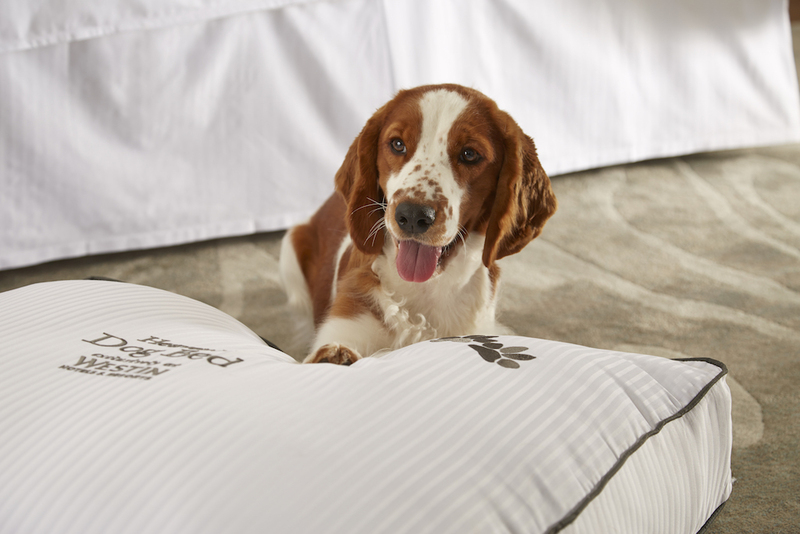 We've pulled together a list of some of our favorite dog-friendly luxury hotels offering special amenities to help furry friends feel right at home. Just a friendly reminder, please be sure to check hotel policies for breed or weight restrictions, along with any travel restrictions for crossing country borders with pets. 1. The Jefferson Washington D.C. The Jefferson Washington D.C. greets guests with its Resident Canine Office, Lord Monticello, a.k.a. Monti. He's a rescue dog welcoming all guests to the property. 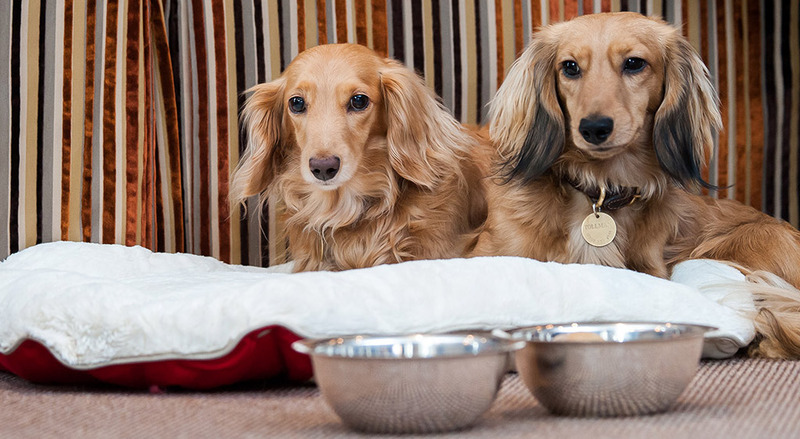 To help dogs feel right at home, the hotel offers pet beds, bowls, and walking maps. Learn more about The Jefferson Washington D.C.
Perhaps you'd like to adopt a dog as a souvenir from your trip? The Westin Mission Hills Resort and Spa participates in a Dog Samaritan Adoption Program, allowing guests to mingle with dogs seeking furever homes. For guests traveling with their own pets, there's an outdoor dining area with a "Patio Pooch" menu, plus Westin Heavenly Pet Beds. Set along one of Baja's only swimmable beaches, the One&Only Palmilla welcomes dogs with a "Dog Passport", gourmet pet dining menus, beds, and dog-friendly poolside cabanas. Featuring a fusion of old and contemporary Mexican styling, there are kids and teens programs, five gourmet restaurants, 24-hour shared butler service, seasonal whale watching, water sports, and an artist in residence, providing comforts for all members of the family. 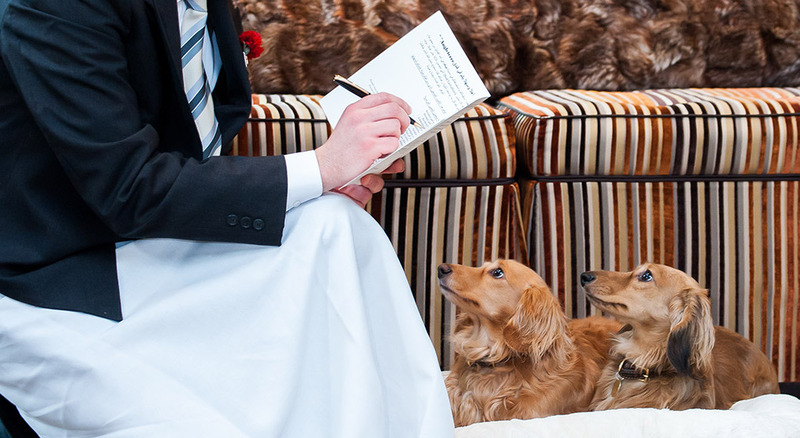 Set in one of London's most prestigious neighborhoods, The Chesterfield Mayfair offers the Very Important Pet Program, which welcomes dogs with beds in various sizes, food and water bowls, goodie bags with toys & treats, and turndown amenities, plus dog sitting and walking services with advance notice. Overlooking the Royal Mews, The Rubens At The Palace offers an ideal London location with Old World styling mixing with the latest modern amenities. The property also provides a luxurious setting for pets, with a welcome hamper filled with toys and treats, custom Rubens Hotel pet beds, food and water bowls along with pet menus, turndown treats, and a special "Do Not Disturb/Pet Sleeping" card for the door. At check-out, pets receive a certificate of stay, and the hotel can arrange a variety of services including grooming, taxis, litter boxes, dog and cat first aid kits, veterinary services and more.